While many assessments exist for content-area vocabulary and comprehension, content-area word identification is often overlooked. Many times it is assumed that students select incorrect answers because of their insufficient content-area knowledge when the failure is actually due to their difficulty in reading multisyllabic words. 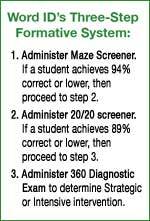 Word ID's reliable and valid Three-Step Formative Assessment System helps content-area teachers identify students in grades 6–12 who need instruction in multisyllabic word identification so they can independently read and comprehend their English Language Arts, Mathematics, Science, and Social Studies texts. The whole-class screeners and individual diagnostic assessments are tailored to each specific content area to measure students' ability to use knowledge of syllable types, syllable division patterns, and common morphemes (e.g., prefixes, suffixes, Greek roots) to decode multisyllabic words. Based on results, teachers can implement an individual or targeted group intervention in a Response to Instruction (RtI) or another instructional improvement framework. Determined by ground-breaking research analyzing approximately 4,500 content-area words, Word ID features targeted prefixes, suffixes, and Greek roots that were selected for their frequency of occurrence in each specific content area. 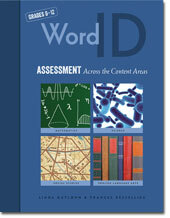 "Word ID has been a useful formative assessment tool in my secondary classroom. I haven't found anything else like it that specifically assess multisyllabic word identification in each content area. As a teacher, I use Word ID as a screener to determine if all of my students are able to proficiently read grade level content materials. The assessments are easy to administer, and there is a great WordIDAssessment website with lots of useful information." 9 1/8 x 11 1/8, spiral bound, lay-flat softcover, 208 pp.